from Sugar Plum Dreams. 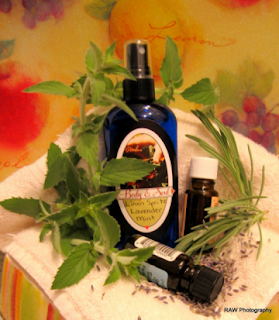 In Becky's shop you will find homemade bath and beauty items, made in small controlled batches with the freshest products we can offer. No chemical laden products here. You will also find hand-beaded & handmade jewelry here, Becky has been designing jewelry since 1997, and is very addicted to beads!! 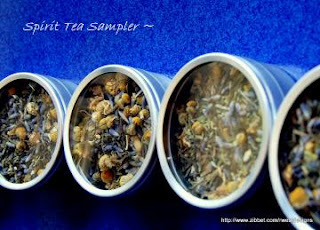 She is also going to start a line of hand-blended teas that will help soothe your body & soul from the inside! Will debut soon!! Oh my gosh I guess you could say purple is my very favorite, but I truly love all colors especially the bright ones ! They most always make me happy! I hope this doesn't sound weird but my daughter is my favorite smell, I just love to hold her and breathe in her scent. It calms me and reminds of the important things in life!! Toss up between the beach and mountains, they both have such healing properties. I love nature, the ocean makes all problems seem so small, it's so soothing to hear the ocean waves they just lull me to sleep and the beauty of the mountains especially when things are all bright kelly green! I also love the singing birds in the mountains. I see the beauty God has put on this earth for us to enjoy, everywhere!! Am I talking too much? Do I love too many things? Nifty: I don't think it's possible to love tooooo much! Favourite sound? Holding my daughter first ,second would be spending time with my husband cuddling together and spending time with my family, third would be creating new products or designing a piece of jewelry with a close second to enjoying a cup of hot tea on my back deck surrounded by my plants ( veggies and herbs), especially the teas I create specifically for my ailments!! All of them? 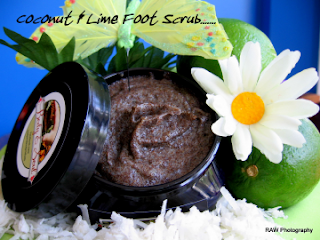 No really..... probably the Coconut Lime Foot Scrub! 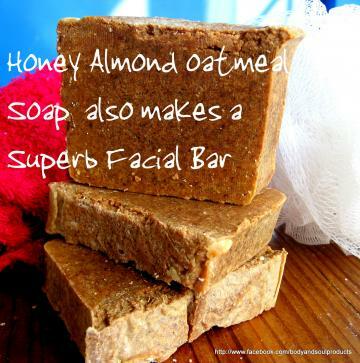 But I do love them all, the Lavender Seas Mud Mask and Honey Almond Soap are two more of my very favorites. Because it really does make my crusty feet like brand new!!! Also it smells DIVINE!! The other two have made my skin look and feel so radiant and feel so soft!! I know exactly what goes into them so that it makes it all the better...all natural no chemicals. Do I have to answer this one?? No really I can't say I have a favorite .... I love so many of them. There are so many talented people in this world with whom I never would have met without the internet!! I love so many shops and blogs!! I haven't sold much online, but I have sold a ton of stuff in person in two retail shops my family used to own. Online is a whole new ballgame. 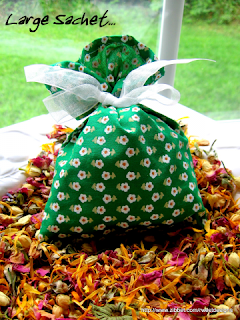 MUCH harder to sell online especially with Jewelry, The bath products we make seem to be catching on a lot quicker than the jewelry did. I love them both. The most useful thing I have learned is PATIENCE & PERSISTENCE it takes a huge amount of work, and a huge amount of posting your urls, and a huge amount of supporting fellow sellers. I truly believe you get back what you send out. So I try very hard to help everyone as much as I can, and not just for the return, but because I just love to help people! I got into making the natural bath & beauty products after seeing all the info on chemicals, and what they do to our bodies, I have a lot of health problems and I want to eliminate as much chemical junk that clogs up my body up as I can. Also I want to give my daughter a head start in life with using all natural products. I once read teenagers put over 165 different chemicals on their skin a DAY !! Could this be why we are so burdened with so much cancer and illness these days. Putting crap ON your skin is like putting it IN your body and it can do just as much damage if not more by applying it to our largest organ... the SKIN!! My husband also loves the natural products!! 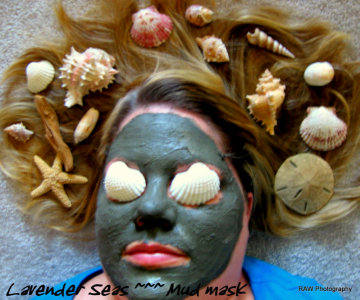 On Zibbet I have combined two creations, the new bath & beauty line called Body & Soul Products, and my jewelry RWestDesigns Jewelry into one shop. I call it Sugar Plum Dreams because I want to be able to list anything I create, I have been known to dabble in hand~made note cards, hair bows, and who knows what else I'll try in the future!! So I didn't want to limit myself to just jewelry or just bath & body. I am in the process of re-doing all of my fine line jewelry photos. They need attention! Once I get this done I will list these on Zibbet in a Hand~Beaded Jewels section...stay tuned for that one!! sellers. Again sending it out there ......plus I get to know the Zibbeters better this way. 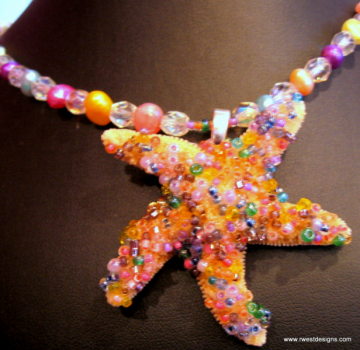 and one more blog about me and my life and jewelry creating!! I do so wholeheartedly agree that online shop owners need patience and persistence. Believe in yourself and your craft, it will all work out in time. Great post and great to learn about fellow Zibbeters. Wonderful interview. I like how it has your comments in between, like a "conversation." Beautiful write-up as always, Heather. Those bath products look luscious, and that lead-in photo is simply marvelous. :c) Great read!